You’re aware that your cell service comes from cell towers. And that your mapping app is made possible by GPS satellites. And that wifi signals deliver your fail videos. But the sight of that invisible world is breathtaking. This summer, a Dutch artist named Richard Vijgen released a video of a project he was working on called the Architecture of Radio. 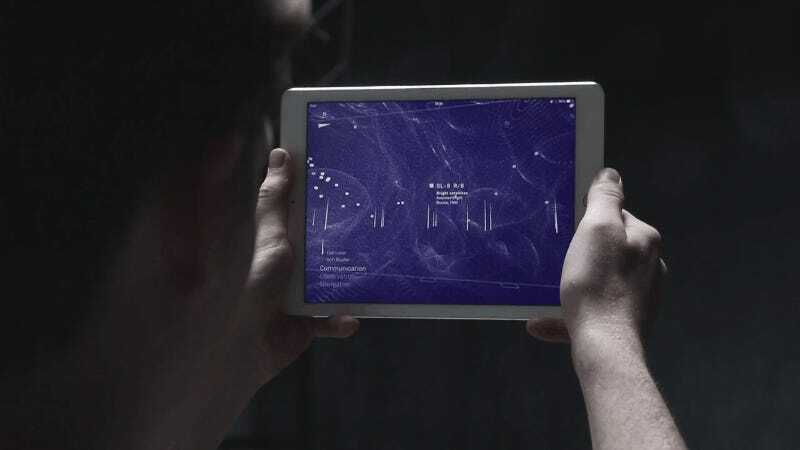 It was an augmented reality app that revealed the waves and signals in a given room, pulling information from publicly available databases on cell tower locations and satellites. It revealed an unearthly, web-like network of invisible infrastructure that powers our world—and unsurprisingly, a lot of people wanted to try it for themselves. As you pan around your house, the app identifies signals and waves as you move: There’s a cell tower 589 meters to my left. If it was night, I could look out for a Russian satellite from 1964 passing to the south. It’s a bit like having x-ray glasses on. The app warns that it is “not a measurement tool.” For example, the atmospheric waves and dots that texture the screen are an interpretation of waves, not a scientific reality. But the actual datapoints are real, based on your GPS coordinates and scraped from a database, which is pretty cool. Or terrifying, if you’re more of a tin-foil hat person. “Most people seem to be amazed by the density of signals, some think it’s a bit scary, others just think it’s beautiful,” Vijgen told Gizmodo over email. In the end, it’s a lovely reminder of the vast network all around us, hidden in plain sight. You can get it here.